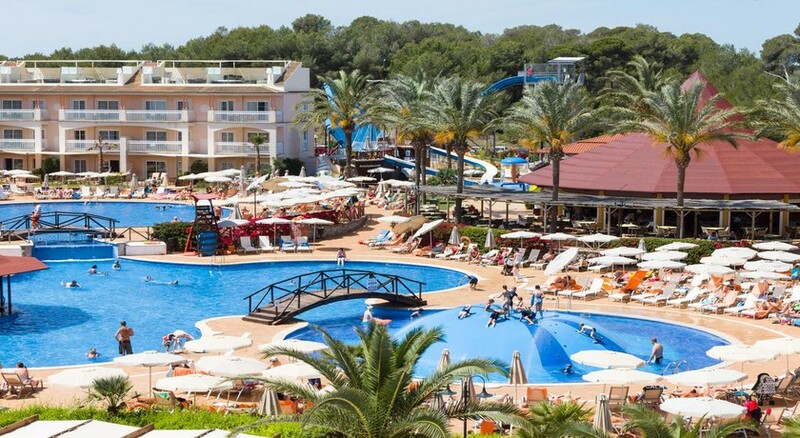 Hotel Zafiro Can Picafort is a Mediterranean-style holiday village on the Majorcan coast which offers luxurious accommodation minutes from the beach. Nestled amidst manicured gardens, this 4-star hotel welcomes visitors who are looking for a fun family-friendly resort with plenty of aquatic entertainment, with five fantastic swim up pools (accessible from the swim up apartments) a luxurious lagoon-style pool, a kids pirate ship, an indoor pool and sports facilities including tennis, squash and volleyball. The hotel is made up of 300 stylish apartments each offering ultimate comfort and gorgeous pool views, guests can choose from a Royal Terrace Apartment, Privilege Apartment, Swim Up Premium Apartment, Select Apartment Pool View and Premium Apartment – each adapted with details to suit all tastes. When hunger strikes, the hotel's high-quality restaurant service is sure to satisfy, with gastronomic options aplenty including Caprice Buffet Restaurant, La Palapa Pool Bar, La Palapa Grill Restaurant, a Sports Bar and Babalu Café Lounge Bar – perfect for tropical cocktails as the sun sets. Its close location to the beach makes for fantastic lazy days spent on the sand, before returning for a dip in the pool! 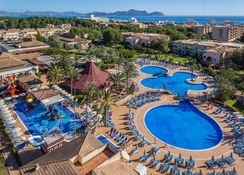 Hotel Zafiro Can Picafort is a 10-minute walk away from the beach in the small resort town of Can Picafort, on the north shore of Majorca. 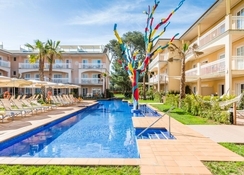 The nearest town is 0.5km and 65km to Airport Palma de Mallorca. 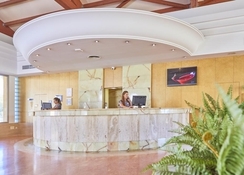 The hotel has a variety of room types including Apartments, Privilege apartments, Select apartments, Swim-up apartments and Royal apartments. All the apartments have a living room, bedroom and terrace, which come furnished with a shower, hair dryer, telephone, LCD, safe deposit box, kitchenette, microwave, fridge. WiFi is available in all of the rooms. Swim Up and privilege apartments come equipped with private gardens. Royal apartments have fabulous private terraces with Jacuzzis. The hotel has the Caprice Buffet Restaurant which serves a selection of regional, national and international food for breakfast and lunch. In the evening it hosts themed buffets and gastronomic corners. 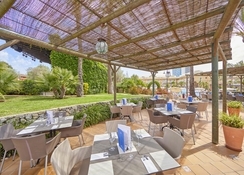 The Babalu Cafe Lounge Bar is open during evenings and offers a range of à la carte drinks. The La Palapa Pool Bar and Grill restaurant serves delicious snacks and drinks by the poolside. There is also a sports bar with giant TV screen that serves drinks and snacks. 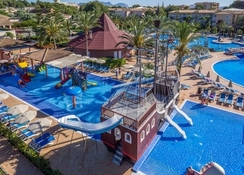 The hotel has a large open-air pool with a sunbathing area to relax in, while the kids have their very own Pirate Ship pool to splash around in. There is also an indoor pool with sauna and Jacuzzi for ultimate rest and relaxation. The hotel has a gym and facilities for tennis, volleyball, aerobics, aqua and squash. On the beach there are activities like archery, biking, diving, snorkeling, mini-golf, billiards, football and paddle squash. There is also a cinema and shows hosted by the entertainment staff from time to time.